Using a paring knife, cut off the top of the peppers and reserve. Scoop out the veins and the seeds, discarding both. Stuff the cheese mixture inside the peppers, packing it tightly. Replace the cap on each pepper. Using a toothpick or skewer, skewer the peppers lengthwise from the bottom through the cap. 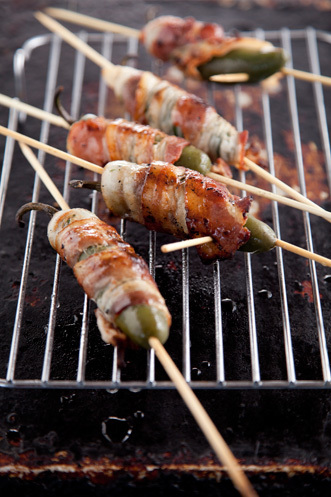 Wrap the slice of bacon, top to bottom, around each pepper, covering the cap, and secure with a toothpick. Put the peppers on the grill, or if broiling, put them on the prepared baking sheet. Grill or broil, turning occasionally, until the bacon is crisp and the peppers are tender, about 20 minutes total. Transfer to a serving platter and serve.